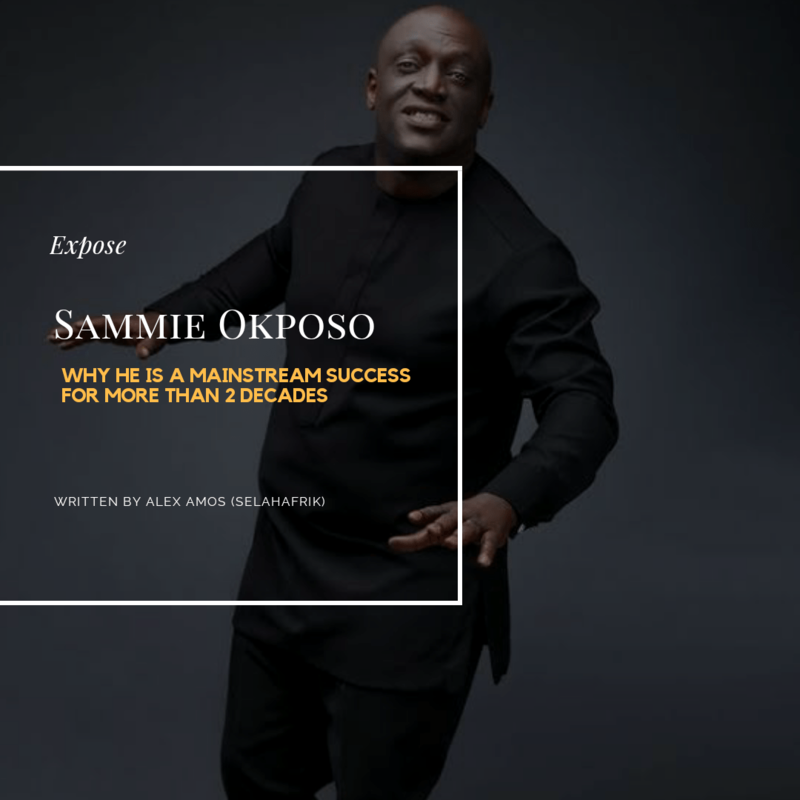 – What makes Sammie Okposo such a successful mainstream Gospel artiste for over 20 years? Find out in this write-up by SelahAfrik’s headhoncho Alex Amos. The name Sammie Okposo is so equivalent to Gospel music in Nigeria that rapper Olamide once used his name to represent the whole Gospel music industry (otherwise known as ‘Mindustry’) in a song. Now, whether Olamide used it derogatorily is not in question here but the fact that he represented the whole Mindustry with the name. That’s how much Sammie Okposo has crossed over. Since the single “Welu Welu” hit in early 2000s, it’s been an upward journey for Sammie Okposo’s music career. From being a UN Peace Ambassador to enjoying several years of Globacom endorsement deal, He is the only Gospel artiste to have enjoyed such a major endorsement deal spanning a period of 10 years, and one of the longest artiste to stay with the telecommunication company. Sammie Okpos has also performed at the annual Silverbird Man of the Year Award, He was part of the artistes on the line up during the campaign of former president Goodluck Jonathan. Sammie Okposo has performed at the Martin Luther King Day and July 4th Independence day Celebration respectively, by the American ambassador to Nigeria. His SOPP concert has toured many countries of the world. He has about 5 studio albums under his belt and the 6th titled “Sammie Okposo Live in London (Audio & DVD),” which he announced recently, is set to drop May 30th. With these premises, it is safe to say Sammie Okposo is the most successful mainstream/cross over Gospel artiste. Most artiste only cross over when their sound adapts the trend of the market, and we have seen quite a number of successful mainstream Gospel artiste, but with over 20 years under his belt, maintaining the original sound of Gospel music (as a genre), Okposo’s relevance has not dwindled till date, it will be a matter of decade, to beat the record of the iconic Sammie Okposo. We’ve had successful Gospel artistes before Sammie Okposo, we’ve seen very successful Gospel artistes after his emergence, but Sammie Okposo can be likened to the father of contemporary Gospel sound due to the longevity of his career, pacesetter attributes and the sustained relevance which spans over 20 years. So what makes Sammie Okposo so relevant and successful in the mainstream, after +20 years doing Gospel music? While we can only go by our study and cannot erase the grace factor – hence the album “Saved with Amazing Grace (SWAG)” – we have compiled some of the points and know it will be of benefit to both the established and the upcoming Gospel artistes. You cannot remove the God-factor from Gospel music. I am not saying this as playing a passive role while God does all the work. Gospel music is not entertainment music, it is the life giving power of God conveyed through melodies. Therefore if you are not spending time to be intimate with the Holy Spirit; also to be trained, developed and mentored while doing the necessary work to perfect your craft, you can only last for so long. As the saying goes, you cannot give what you do not have. It should be noted that the legendary Sammie Okposo is under the mentorship of his senior pastor Pastor Paul Adefarasin at House on the Rock church where he submits himself to the music directing prowess of multiple award winning music producer Wilson Joel (Music Magnate). Go and look at any Gospel music artiste who is not under any authority and measure his career in number of years, you will see the undeniable difference between him and the one under authority. The excellence that goes into Sammie Okposo’s stage craft is glaring. Being one of the most booked has not slowed Sammie from always giving live ministrations as opposed to lip-syncing. This means that he and his band X-Generation, takes rehearsal time very seriously. Furthermore, He is pushing the limits with the new live recording album and DVD tagged “Sammie Okposo Live in London,” a feat similar – but in greater proportion – to the launch of “SWAG” album which was recorded live and processed into DVD format. I have been privileged to work on some of Sammie Okposo’s online campaign and I can tell you that after all the milestones, he still runs campaign for every new job like it’s his first job. Do you know what that means? That means he does not leave any stone unturned, nor does he just “release for Instagram”. Every release, every concert, in fact, every effort is treated like a major project. This includes getting the best hands on the job. Someone may say at least he’s got a platform but there are a number of artiste who have attained some colossal status and would rather depends on their fan-base (these days, that means the artiste personal Instagram account) than do a professional promotional campaign. This is the “arrived” mentality that has stolen the relevance of so many Gospel artistes. There are Gospel artistes who were very big 3/4 years ago but have suddenly faded off the radar because when they were in their prime, they suddenly stopped pushing as hard as they did before they hit the spotlight. Many forget that spotlight only goes where the action is. It’s been over 20 years and Sammie Okposo still manages to keep the spotlight on himself without getting lost in the momentary applause, but works with intentional precision. “Welu Welu” became a hit about 20 years ago but Sammie still treats every release like it is his first even after 20 years. It’s only logical that such success should spill over! This attitude alone is a state of mind that produces far more result than intelligence, creativity and talent. Sammie Okposo has given us all, a whole new perspective to persistence and consistency that goes beyond one single win to a lifestyle of winning! I am yet to see an A-list artiste who acknowledges and respect his immediate market like Sammie Okposo does. It takes a good business man to recognize the channel, where the feedback is most prominent and demand is most active; leverage on the fact and maximize profit. Now because this is not Commerce or Economy, let’s not limit profit to monetary value only. About a decade or two ago, a number of Gospel artistes, including Sammie Okposo, broke out into the mainstream market because they were exceptional… not necessarily because of the spiritual essence of their music. The market has changed now. The Entertainment industry has created a larger supply of what we call ‘secular music’ which has forced Gospel music to come into its true self. These days, you are either giving out content with that scarce spiritual depth that beckons on the spiritual need of the average man or you can just go do secular music! The fluke does not work anymore. There are no in-betweens! This premise has made the market a little more dynamic. While Gospel artistes can still break into the mainstream, the real demand for Gospel music starts with the fans of Gospel music! There are a number of Gospel platforms (such as SelahAfrik) which serves the needs of the Gospel fans. This spans across online, to the traditional media. These fans go to these platforms for the supply of their Gospel music needs, it is as this demand increases that the spillover begins to enter into the mainstream market. For instance, recently Mercy Chinwo has caught the attention of the mainstream market but she had the Gospel folks on lockdown for a little longer before the eventual breakthrough. To ignore this system, skip the Gospel platforms and jump on the entertainment train is to hit the floor hard. What are we saying in essence? Sammie Okposo is sensitive to this system, and unlike some of the major Gospel artistes, he has leveraged and maximized the advantage that the Gospel platforms provide so as to maintain his relevance in the new market. Further more, Sammie Okposo is also very active on social media, thereby taking advantage of the oppurtunity the new market provides. He does not fail to encourage mentions from various individuals and platforms with replies, likes and reposts… To hell with the social media celebrity attitude! This encourages the spread of his contents. Don’t get me wrong, some of these artistes have ignored this system and are doing good right now, but our focal in this article is not on the momentary buzz but on the long-term – the factors that has made Sammie Okposo relevant for over 20 years. One of the greatest life lessons I have learned came from the character of English Language. The reason why English Language became a universal language is because of its association with other languages. English language borrows from Greek, Latin, French, German and more languages. It’s been more than 20 years that we have been told that the Chinese language will take over from English language to become the world’s language and even though statistics favour this claim, English language is still the language of the media! The reason for all these expose? Sammie Okposo over the years has adapted various genres and trends without losing the essence of his brand or message in portraying his music, videos, etc. A recent example is the single “Kabiyesi Bayete” which is a combination of Yoruba and South African language in delivering a powerful contemporary worship song. Aside the technicalities of music, Sammie Okposo also extends a good hand of fellowship to colleagues and sensational artistes of the moment. In 2015, before “Excess Love” became a national anthem, Mercy Chinwo was on the Sammie Okposo Praise Party (SOPP) train that toured Enugu, Abuja, amongst other places. He was also part of Naomi Classik‘s concert – “All About Jesus Tour’’ – in 2016 which toured 3 states. This was a period when the singer was kicking off her music career professionally. What’s that saying again? A candle lose nothing by lighting another candle right? Yeah!